Oh maaaaan do Zara hit the nail on the head when it comes to stylish baby clothes. Everything they do is so on trend, and a refreshing change to the usual sailor/floral options most shops offer. I always get so many compliments on Zach's outfits, and he definitely has a better wardrobe than me! Whilst their clothes aren't unisex they are the one high street store I have found that goes against gender stereotypes. As someone who doesn't like the whole 'pink for girls, blue for boys' thing their pieces are right up my street. Currently they are stocking several items in pinks and purples in the boys section which is amazing as I haven't seen this anywhere else! In general the price of children's clothes is a little ridiculous considering how small the pieces are, and how little wear they will get out of them. In comparison to other brands I think Zara's prices are really affordable, although some of their pieces can be a little more pricey. They have a huge range of tops at £2.99 and leggings at £6.99, and these are the items I buy which make up the bulk of Zach's wardrobe. One of my pet peeves when it comes to shopping online is waiting for your order to be delivered. 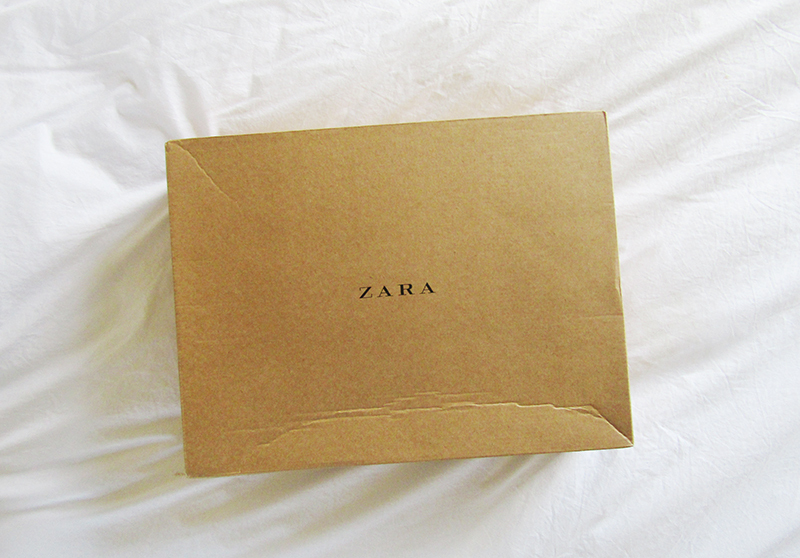 I have found that my Zara parcels tend to arrive after just two days which is pretty amazing. I also get things delivered to store when I don't hit the threshold for free delivery, and again there is a really quick turnaround. Now I think I will be alone with this one because in general people seem to find that Zara's clothes come up a bit small, but as Zach is such a tiny dot their clothes are always huge on him (especially their trousers!). He will be 15 months old next week and the 12-18 months clothes I have just bought him will probably last until the winter! It means that he gets a lot of wear out of everything, which means I get my money's worth. Do you shop at Zara for your little ones? I LOVE Zara for baby clothes and it's wear I've made the bulk of my purchases since my twin girls arrived. I totally feel you on the gender neutral thing - I find that even the dresses aren't over the top girly and froufrou - they come in gorgeous colours and patterns that i'd be pretty proud to wear myself!